The New York Rangers are just eight wins away from the Stanley Cup, but just how far behind is the Iceman? A security guard has been murdered inside the World’s Most Famous Arena, and the killer has left behind a note threatening more bloodshed should the buildings occupants succeed in their mission to capture hockey’s Holy Grail. In order to apprehend the murderous ‘Iceman’ before he strikes again, the NYPD turns to its most celebrated homicide investigator. Enter Detective Jack Placey, an unorthodox cop who has as many personal issues as he does solved homicide cases. Alternating between bouts of narcolepsy and insomnia, Placey is teamed up with Sergeant Ramona Isis, a sharp tongued hockey fanatic with demons of her own. 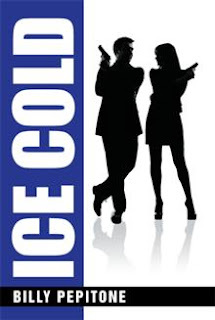 The two investigators encounter a sideshow of possible suspects across three states in an effort to bring the Iceman to justice before he kills again and derails hockey history. Can Jack Placey stay conscious long enough to keep the killers trail from turning Ice Cold ? That is the storyline behind New York City Police Officer Billy Pepitone's (that's a great New York name, isn't it?) new book. Billy gave me a copy of this book months ago. I finally got around to reviewing it this week (ironically reading it as the New York Rangers are getting "murdered" by the Boston Bruins in their playoff series). I must admit that I am not much of a fiction reader, so that's why this book fell so far down my reading list. But as I embarked on my first camping trip of the year this book found it's way into my bag and was the first one out. Alright, I figure, I'll give it a shot. I was hooked, right from the very first sentence of the book. "For me, dying was a daily occurrence." I have no idea why, but after I set up my tent and entertained the dogs, that line intrigued me instantly. I quickly found a wonderful reading experience, thoroughly enjoying the author's writing style - which I describe as fun. I proceeded to finish the book in the afternoon, stopping only intermittently to entertain the dogs. Like I said - I'm not much of a fiction reader. But I will read Billy Pepitone's next hockey novel for sure! Billy Pepitone is a retired New York City Police Officer turned author, screenwriter and freelance hockey writer. In 2010 Billy and his writing partner and brother Joseph co-authored the baseball novel "Soul of a Yankee". The two have also collaborated on two award winning independent films with a third in pre-production as of February 2013. Billy currently writes for several hockey sites and is a frequent guest on "The Instigators" National Hockey League-themed online talk show.